I spent almost as much time looking for a trailer on line as I did watching the movie this morning. There are actually several sequences that are available if someone wants to watch a movie in bits and pieces. That seems strange to me, but the world is changing and sometimes what people want is something I never would have imagined. For instance a camera in a phone that you carry around with you. Now we can record video of where we were when we were interrupted by the phone in our pockets. Anyway, what I have for you above is the opening credit sequence of the movie for today. It will have to do for now, and the truth is It will probably be more entertaining than a trailer. 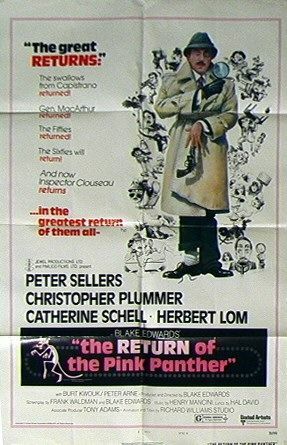 This is the fourth Pink Panther film and the first one of the seventies I believe. It was the start of the successful Panther films in the second half of the decade, and it is odd that it appears not to have been one of the most popular ones. 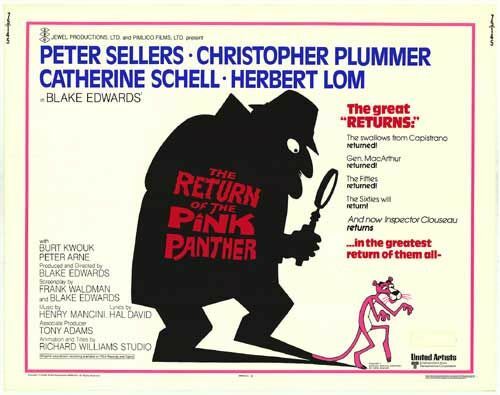 As far as I was concerned, it was ten times better than Revenge of the Pink Panther that came out three years later and on which it appears they spent more money. The series is filled with slapstick moments and silly dialogue but sometimes it seemed that the effort was too noticeable. 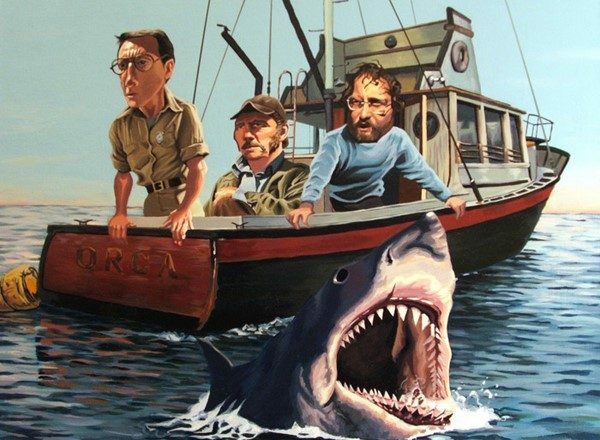 The later films feel a lot like a clown that honks his horn more frequently as the jokes and responses fall flatter. Maybe this one works because it seems fresher and we were not bombarded with Inspector Clouseau every minute of the film. There is a nice jewel heist sequence to start off the movie, and the famous jewel makes a return appearance in the series. Clouseau does not show up for fifteen minutes. When he does appear,there is a great sight gag with a baton, pure slapstick. This is followed up by one of the funniest dialogue sequences in any of the movies. Sellar’s accent and pronunciation start off the joke and then it gets more hysterical by playing with the bureaucracy of French laws for street performers. I must have seen this movie with Art Franz, because I remember frequently doing the dialogue from the accordion player with the monkey with Art. “What are you blind?” “Yes.” He did the French accent on the “Yes” better than I did. I still reference the line from time to time here at home. The slapstick sections are played pretty naturally, but this looks like it was the start of Blake Edwards indulging the jokes a bit too much; there are slow motion segments at the end of two or three bits of business that are supposed to extend the joke but to me they seem to belabor the point. The crisp karate interplay with Kato in the films becomes less interesting when we have to see plates and lamps and all manner of drywall come down on top of the actors in slo-mo. There are some simply inspired comments and actions from Sellars during the sequence where he is pretending to be from the phone company. I am still laughing at how he diagnosis that there is nothing wrong with the phone in the entryway, so he can gain access to the study. I won’t give it away but if you see it you will know. The pratfalls in the study are solid and there is a silly payoff on a glue joke. There are some similarly bright spots in a sequence in a hotel room where he is trying to search disguised as an employee with a vacuum cleaner. These segments don’t become too repetitive because between them there are some scenes where Christopher Plummer as the Phantom, does his own investigation and there are some action sequences and different comedy tones to balance out the over the top Clouseau. I enjoyed this visit from the Pink Panther more then the last one that I wrote about. I have one more Panther Film in my collection that I purchased for this summer series. Unfortunately, it looks like my memory was off and it was actually a December release and so it doesn’t fit my goal for this blog. I’ll tell you what though, if you don’t go searching through data on line to find out, I’ll sneak it in one day when I need a comedy and the other summer choices seem slim. That way we can all win. Well, the World Cup Final calls, so I’m off to root for the Netherlands. I don’t really give a damn but my future son-in-law is a Van Lahr, and I don’t want the octopus to be right.